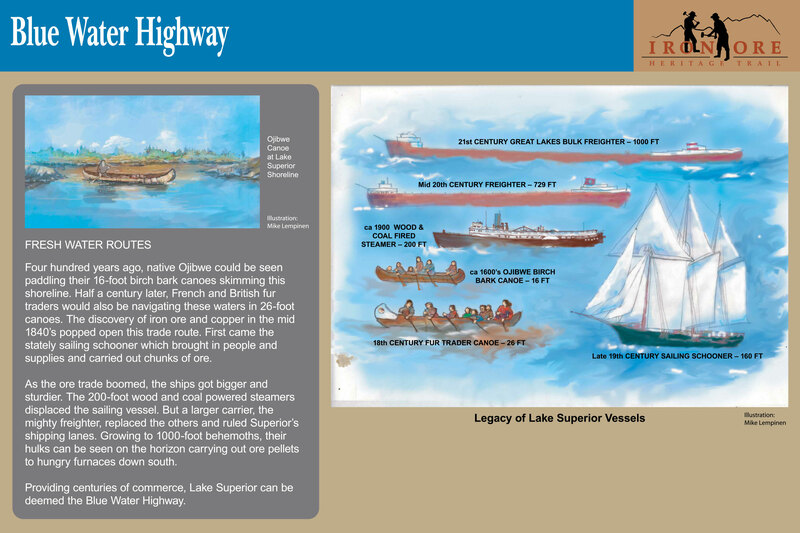 Providing centuries of commerce, Lake Superior can be deemed the Blue Water Highway. 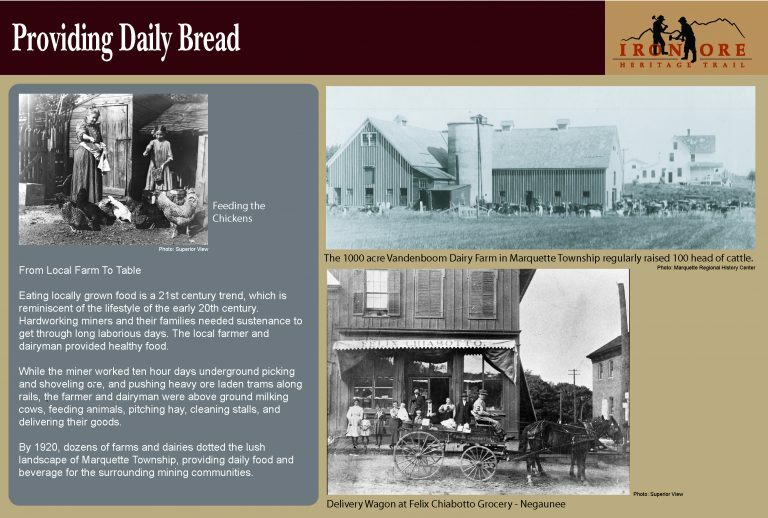 While the miner worked ten hour days underground picking and shoveling ore and pushing heavy ore laden trams along rails, the farmer and dairyman were above ground milking cows, feeding animals, pitching hay, cleaning stalls, and delivering their goods. The very first pocket dock was designed in the 1850’s. 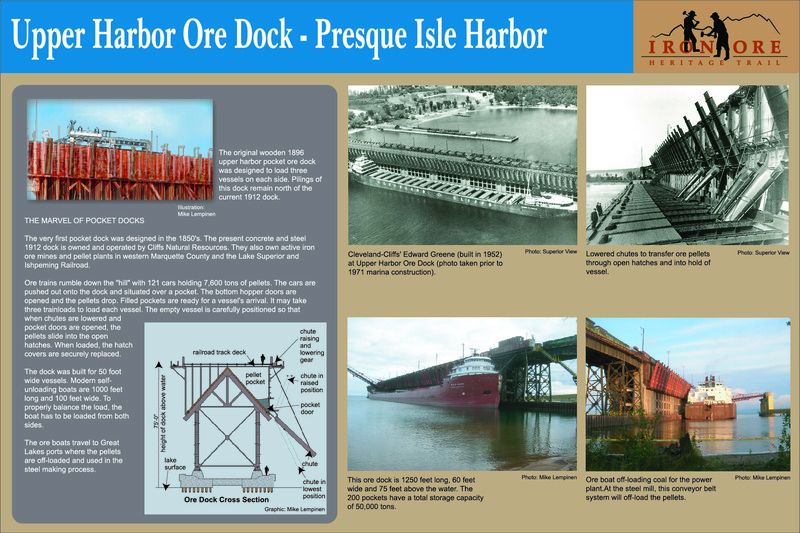 The present concrete and steel 1912 dock is owned and operated by Cliffs Natural Resources. They also own active iron ore mines and pellet plants in western Marquette County and the Lake Superior & Ishpeming Railroad. 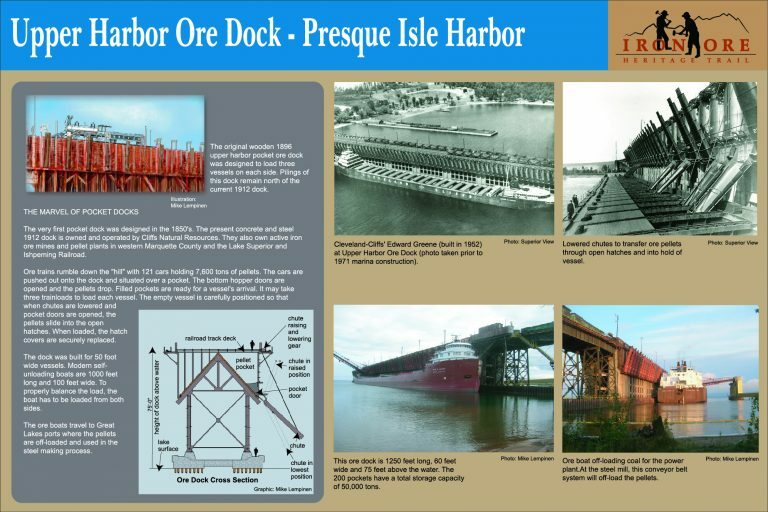 The large concrete dock that still stands was built in 1931. 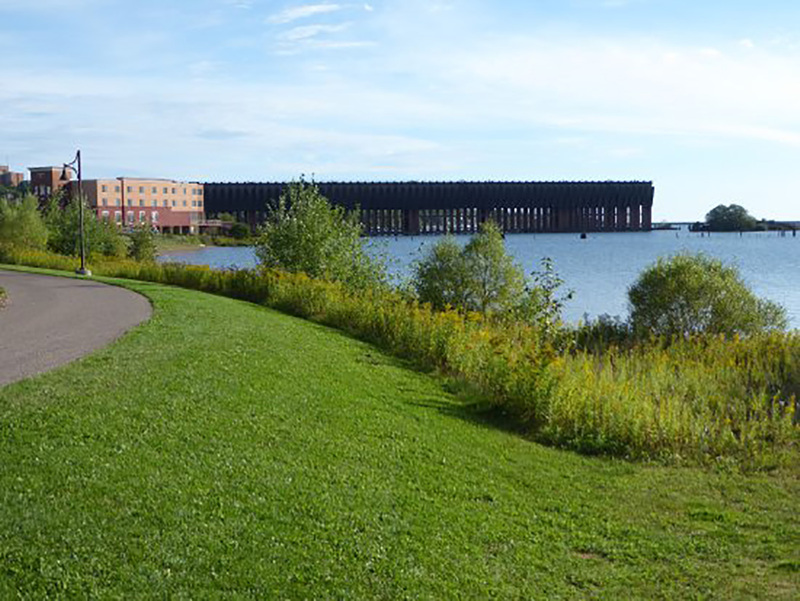 It was constructed for the Duluth, South Shore and Atlantic Railroad (later to become the Soo Line). 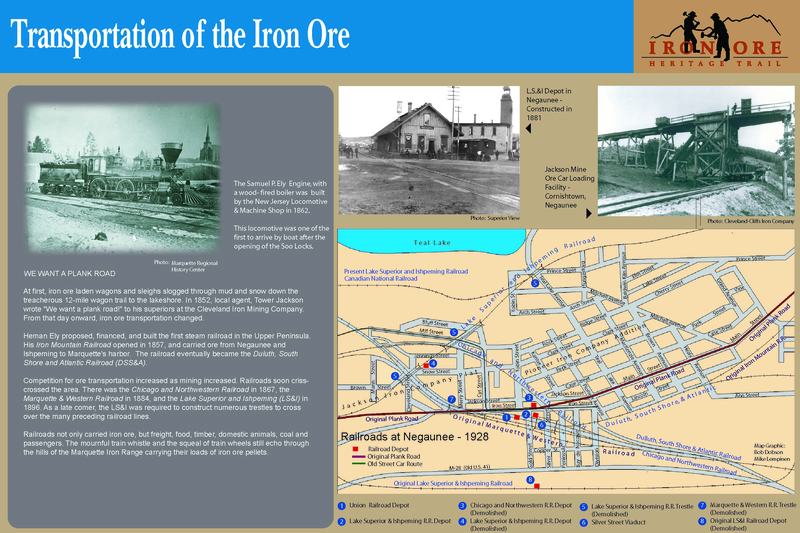 The first load of 10,103 tons of iron ore came from the Ford Motor Company’s Blueberry Mine west of Ishpeming. The loading took 92 minutes. “Jake, this is just like home. Come on,” wrote Michael Guelff, a German immigrant, to his “Old Country” neighbor, Jake Fassbender. The two men farmed the rich land sitting between the rocky, ore producing earth of Ishpeming and Negaunee, and the bustling harbor town of Marquette. 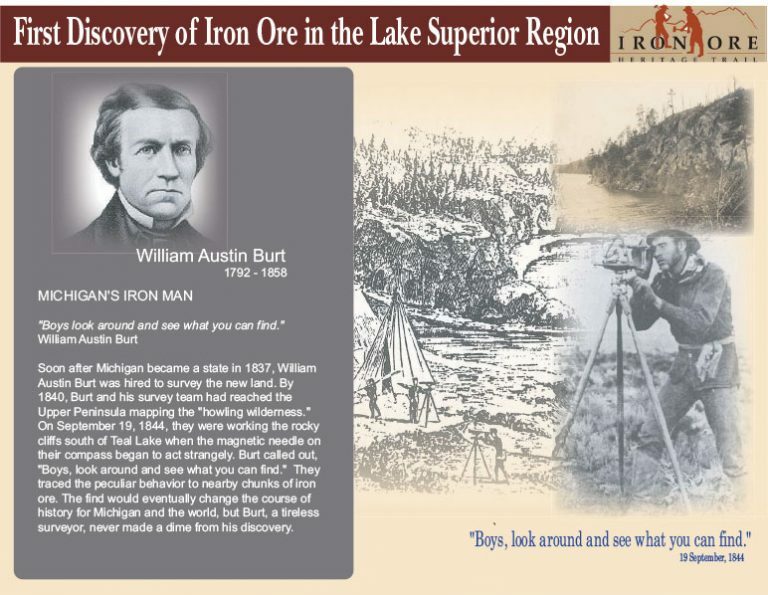 Since William Austin Burt’s discovery of iron ore in Negaunee in 1844, countless companies tried mining ore on the Marquette Iron Range. 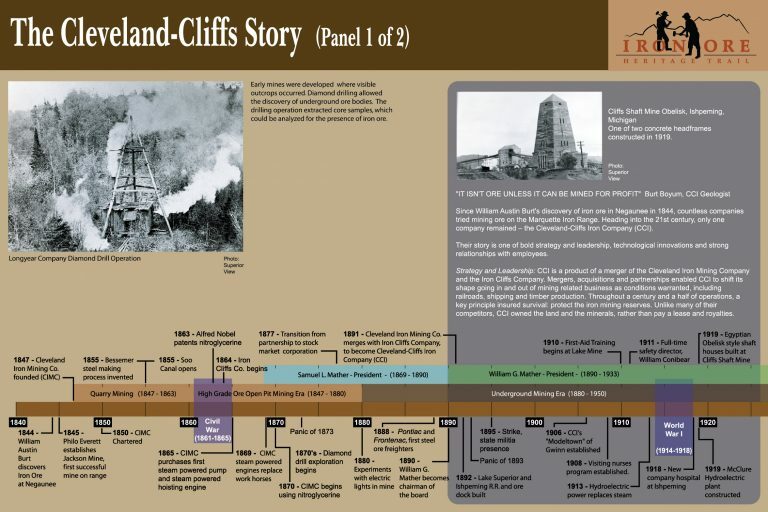 Heading into the 21st century, only one company remained—the Cleveland-Cliffs Iron Company (CCI). 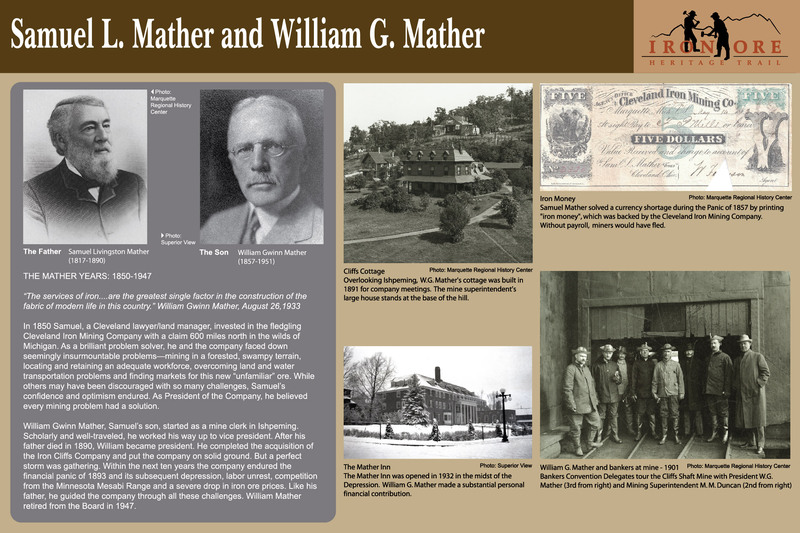 Samuel and William Mather devoted their lives and fortunes to these iron mines for nearly a century. Like a little girl overwhelmed by a large blueberry patch, the early miners must have thought the iron ore would last forever. They worked the exposed outcrops with picks and shovels. Discovering iron ore was easier than mining it. This first open pit mine in the Lake Superior region started as a mountain of ore 150 feet high. Workers began prying ore from the surface with a bar and pick. Later they hand- drilled holes and filled them with explosives to fracture the ore body. Lured by copper in the Keweenaw, Philo Everett and his business partners from Jackson, Michigan, knew nothing about mining or the rugged Upper Peninsula, but that didn’t stop them from coming north in 1845. The Jackson Mine started with fewer than a dozen men working the crude quarry. Some of the first to work here came from the tin mines of Cornwall. They brought double-jacking, a method for hand-drilling that required three men; two to hammer with sledges while a third– often just a boy–held the drill. Mining was dirty, dangerous, and backbreaking work. As a boy, Glenn T. Seaborg must have felt the earth shake many times from the dynamite blasts set off to fracture the hard iron ore. He probably never imagined that the inventor of dynamite, Alfred Nobel, would play a major role in his life. Glenn moved to California at age 10 and later graduated with a Ph.D. in Chemistry from the University of California, Berkeley. He went on to discover Plutonium, Seaborgium and 8 other elements. In 1951, Seaborg won the Nobel Prize for Chemistry. News of the “Mountain of Ore” attracted investors. Competition for the rock outcrop led an ongoing dispute between the Cleveland Mining Company and the Marquette Iron Company. Each company sent workers to live at the site until the mining claim was secured. Cabins were built and burned, potatoes, parsnips and carrots planted and pulled. Finally after seven years, the Marquette Iron Company secured title to the knob. 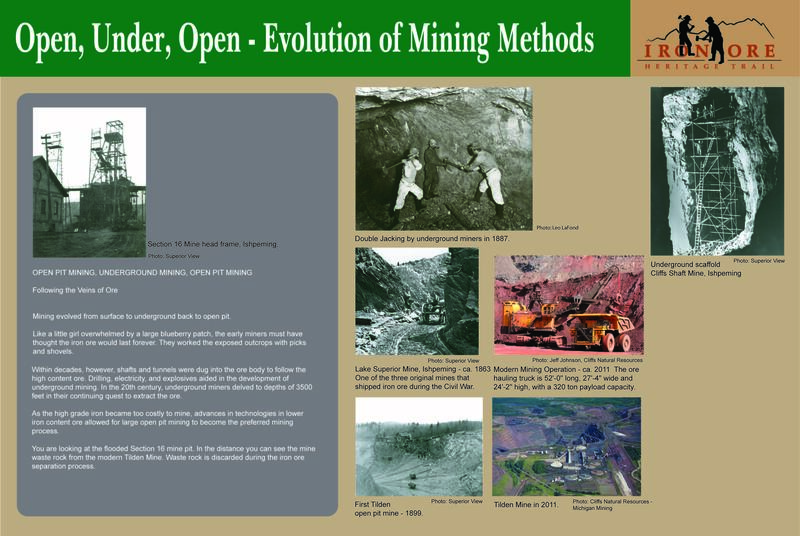 Mining evolved from surface to underground back to open pit. 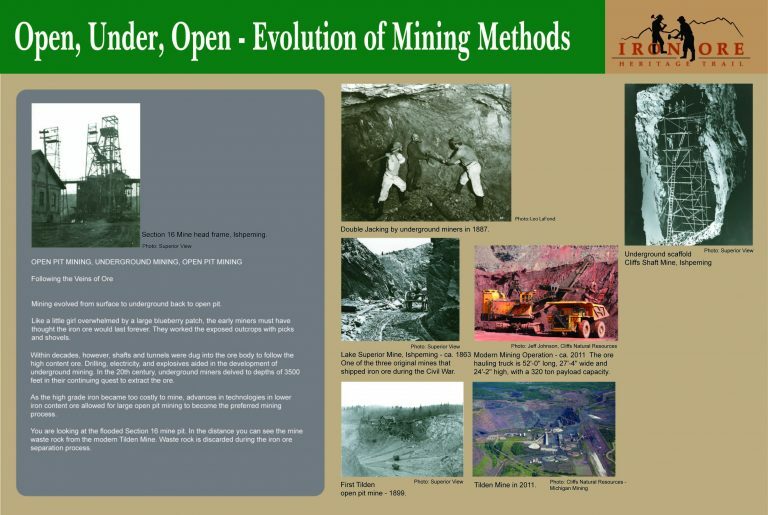 Within decades, shafts and tunnels were dug into the ore body to follow the high content ore. Drilling, electricity, and explosives aided in the development of underground mining. 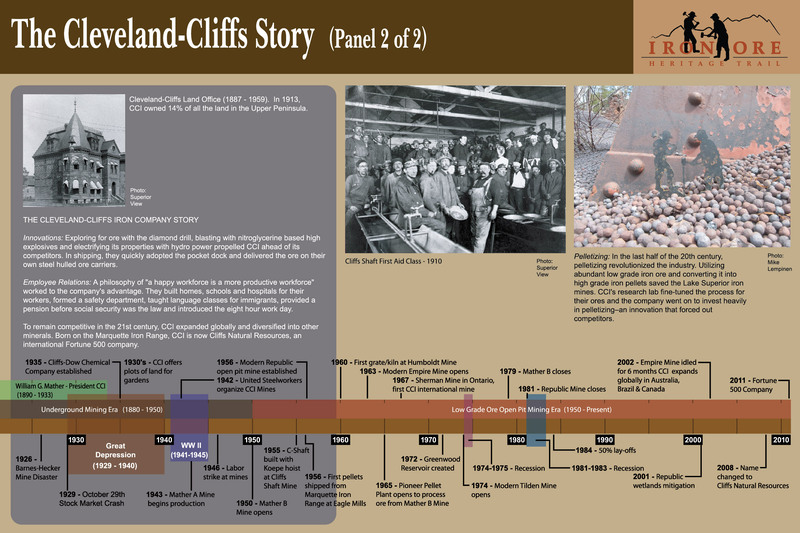 In the 20th century, underground miners delved to depths of 3500 feet in their continuing quest to extract the ore. Many of our modern roads follow early trails made by indigenous peoples. Native American trails were like our present highways, without paving and stop signs. They were so well traveled that at places the depression of the soil is still visible. There could hardly be a more unfavorable location for a town site. It was in the middle of a large cedar swamp with Partridge Creek meandering through. 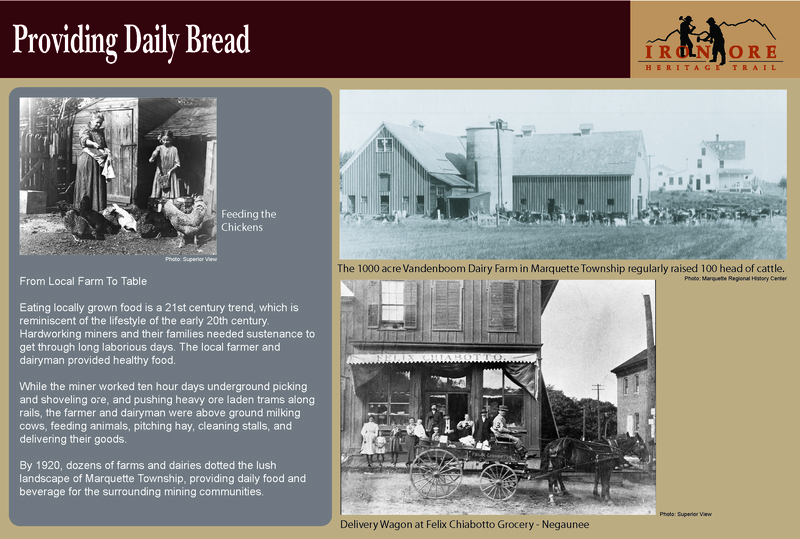 By 1860, two settlements developed next to the earliest iron mine sites: The Cleveland Mine and The Superior Mine. Waste rock from the mines eventually filled the cedar swamp. Timber was used in all methods and eras of mining. It stoked steam locomotives, was cut for railroad ties, burned to make charcoal for forges and furnaces, assembled into headframes and cribbing, and built into huge ore docks. 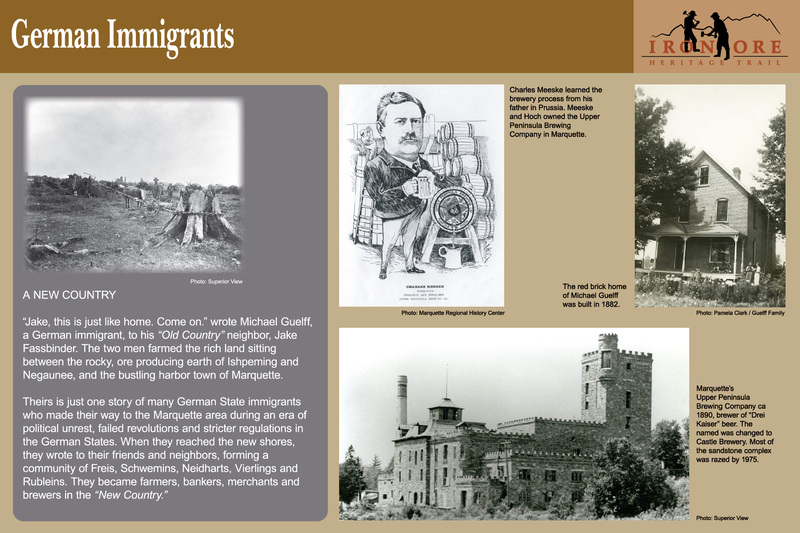 Look around to find the remnants of the immigrant neighborhoods – the built environment of the home foundations, sidewalks and streets. But also notice the vegetation. Not all of the plants you see are native to this region. The immigrants who migrated to pry out the iron ore, brought seeds and seedlings from their homeland providing comforting, familiar foods and flavors to this harsh new environment. 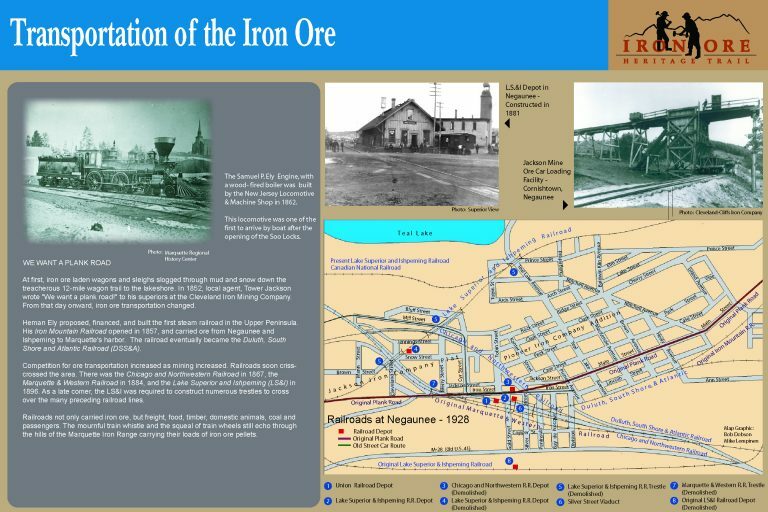 Why Iron Ore Is Here– When and How Did Iron Compounds Form? Deposition of iron was followed by a period of intense mountain building. During this period the iron rich sediments were folded and faulted, subjected to heat and pressure, and intruded with volcanic material. Weathering, erosion and glaciation helped to reduce the uplifted rock to a relatively flat surface.